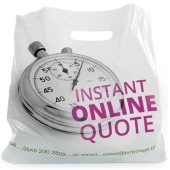 Vest Carriers - buy vest carrier bags at fantastic discount prices or design your own carriers - get a quote in 60 seconds! Vest carriers - the classic bags which look like a vest! The most popular type of carrier bag in the United Kingdom and many other countries around the world is the vest-style carrier bag or vest carrier, so called because of its vest-like shape when laid out flat. The main section of the vest carrier bag, which carries the goods, looks like the main part of a vest that surrounds the midriff, whilst the carrier bag handles, which extend upwards from the bag opening, look just like the shoulder material on a vest, which of course has no sleeves. Vest carriers are made from high density polythene (HDPE) - a lightweight but strong from of polythene which is more crinkly than the low-density version, hence why vest carriers are often referred to as 'crinkly carriers'. 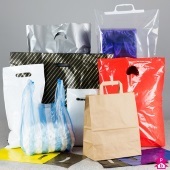 The strength of HDPE allows vest carrier bags to be produced with a very thin layer of polythene - ranging from 8 - 28 microns thick (32 - 112 gauge) - whilst still retaining good bag strength, meaning they can be produced at very low cost. They are available for as little as 1p per bag or even less if you choose to buy in bulk. It is this great value for money which makes vest-style carrier bags very popular with retailers of all sizes, from nationwide supermarket chains to small independent grocery stores, right down to your everyday corner shop or market trader. Since October 2015, most retailers across the UK have been required to charge customers 5p for each carrier bag they take away from the shop in a bid to reduce bag waste. England was the last country to introduce the carrier bag tax, which was first introduced in Wales in September 2011. Customers say vest is best! Vest carrier bags are popular with customers as they are light and strong, whilst the handles offer a convenient ergonomic method of carrying. The combination of vest-style handles and lightweight polythene mean that multiple vest carrier bags can be wrapped around the palm and held in one hand - provided of course that their contents can be lifted by the person doing the shopping! 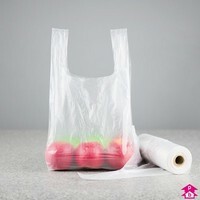 One other consumer benefit of the vest carrier bag is that the bag's lightweight HDPE polythene means it can be scrunched up into a very small ball after use. This means that, once the shopping has been unloaded from the bags, they can be placed in a convenient storage location for future use without taking up too much space. 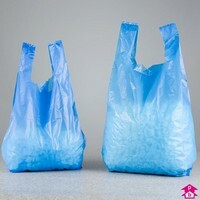 Many households contain carrier bag dispensers - a convenient storage device made of plastic and full of holes, which allow used carrier bags to be placed in the top and then dispensed through the holes that run up the length of the holder. Vest carriers are a particularly good fit for carrier bag dispensers, given how easily they scrunch up into a ball and the fact that they don't tear easily even when tugged. Vest carrier bags can be re-used for a multitude of tasks - from carrying shopping a second (or third or fourth) time to wrapping packed lunches or using as a rubbish bag at the end of its life-cycle - which proves the term 'single use carrier bag' to be something of a misnomer, as explained below. There's no such thing as a single-use carrier bag! Vest carrier bags are typically the type of carrier bags to which people refer when they use the term 'single use carrier bag'. 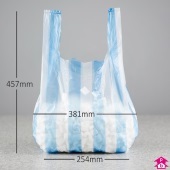 The term has even been applied to government legislation - The Single Use Carrier Bags Charges (England) Order 2015 - that requires large retailers across the UK to charge customers five pence for every carrier bag that they use. For government to use this kind of terminology is irresponsible and counteracts the purpose of the legislation in the first place. The carrier bag tax was introduced to reduce waste and encourage people to think more responsibly about how they use carrier bags, but there is nothing about the high density polythene (HDPE) carrier bag commonly used by supermarkets which means that it can only be used once. 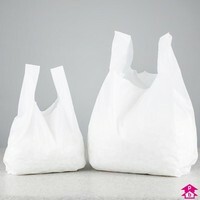 HDPE is a very strong material capable of carrying all manner of regular shopping items. If it wasn't, it wouldn't have been the preferred choice of carrier bag for the UK's largest retailers for decades. When the vest carrier bag has performed the task for which it was originally intended - i.e. carrying shopping from store to home - then in all likelihood it will still be in perfectly good condition to be used again. Responsible shoppers store their vest carrier bags and re-use them for shopping at a later date, or perhaps for a range of other tasks around the house. These might include wrapping packed lunches for schoolchildren or keeping wet or dirty PE kit separated from the other contents of a school bag. 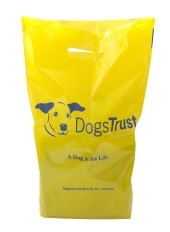 Carrier bags can be used to separate shoes being packed in a suitcase when going on holiday, to pick up dog mess, or as temporary rubber gloves when scooping out food from a sink plughole or dirt from a drain. They can even be used as a handy rubbish bag before being disposed of at the very end of their life-cycle. By calling vest carrier bags 'single use carrier bags' you risk encouraging some people to simply throw the carrier bag away once it has been used, therefore wasting valuable resources and contributing to the litter problem that carrier bag legislation was intended to resolve in the first place. Given the importance of reusing carrier bags, as laid out in the article above, we thought we'd provide you with a few handy hints and tips for using your classic crinkly carriers over and over again. Cyclists or joggers, if you're heading out for some exercise in the pouring rain and you need to keep any valuables such as a mobile phone, wallet or tablet dry, try wrapping it/them in a vest carrier to provide a suitable shield just in case the rest of you bag or pocket gets soaked. Beat the frost on your wing mirrors in the winter by wrapping them both with a vest carrier bag, to ensure the frost stays off them and you can see everything in your mirrors without needing a scraper, de-icer or any such anti-frost device. Simple but effective! A simple classic to finish. If your bag has really seen its last legs and you don't think it can take another exciting use like any of those listed above - and you're about to throw the bag away, make sure you give it one last use as a makeshift bin bag. Carrier bags are often a great fit for a lining a waste paper or a pedal bin, before handily gathering the contents and disposing.